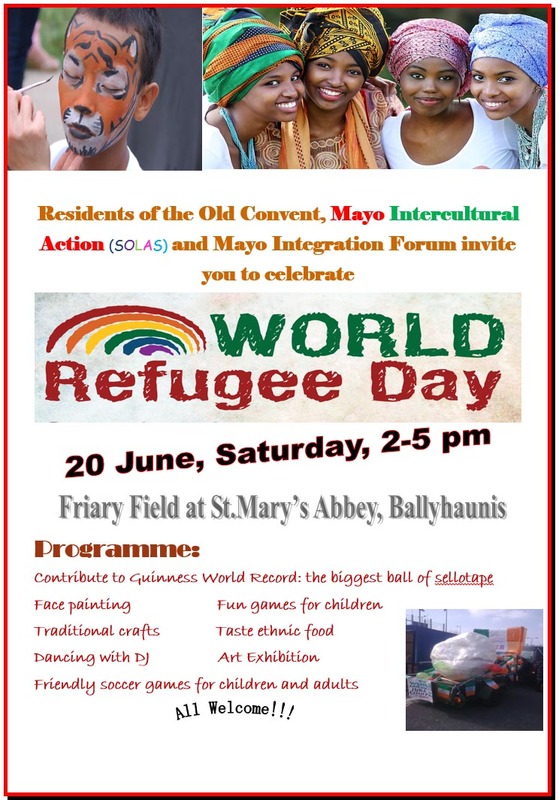 Asylum seekers residents of the direct provision centre The Old Convent (Ballyhaunis), Mayo Intercultural Action (SOLAS) and Mayo Integration Forum invite everyone to celebrate the World Refugee Day on the 20 June 2015 at 2-5 pm, venue: Friary Field at St.Mary's Abbey, Ballyhaunis. The event will bring together refugees living in Mayo and local communities with the view to promote positive integration in our society. This family fun day will create the opportunity for everyone to meet, talk, play, dance, exchange, get to know each other and help to address isolation of asylum seekers in Mayo. The event is promising to be packed with activities and fun, such as facepainting, fun games and races for children, traditional crafts, dancing, art exhibition, ethnic food, friendly soccer tournaments for adults and children. Bring a roll of sellotape with you and help us to break Guinness World Record making the biggest Ball of Sellotape in support of building awareness of the Direct Provision system in Ireland. All welcome to come along, have a great time and meet refugees living in our community.